# 9 in our Waikiki map. Hotel Name: .... Hawaiian Monarch Hotel and condo. Address: ......... 444 Niu St. 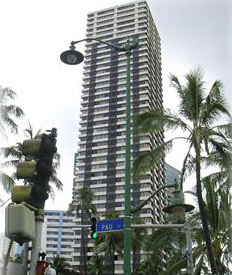 The Hawaiian Monarch Hotel and condos is located at 444 Niu Street between Ala Wai Boulevard and Kalakaua Avenue in Honolulu, Hawaii. Built just over the McCully bridge on the Waikiki side, it is within walking distance to the Convention Center and the Ala Moana Shopping Center. The building is a 44-story multi-use project comprised of 439 units. The building was completed in 1979. These units include residential condominium apartments, hotel units, shops and a parking structure. Amenities include a swimming pool and large sun deck. The first six floors include a parking garage, check-in lobby, elevator lobbies, commercial units, offices and laundry facilities. Operation of the elevators is strictly limited to those with a security card. There are some street parking areas walking distance to this hotel but be advised that spots are hard to find especially after 6 p.m. This hotel is number "9" within the green zone of our waikiki map, click here to see it's location in relation to other hotels in Waikiki. It is in very close proximity to the Honolulu Convention Center which makes it a good choice for travelers attending events there. It is also within walking distance to the Ala Moana Shopping Center, which makes it a good choice for those shopping oriented visitors since the Ala Moana Shopping Center is the largest one in the State of Hawaii. 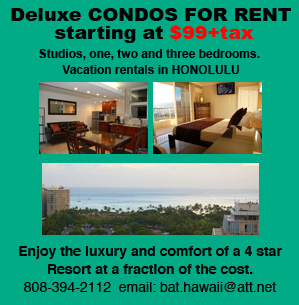 Has very easy access in and out of Waikiki which makes it a good choice for people coming for work that do not need to be "in the middle" of Waikiki . This building is WAY too far from the beach for most visitors, in fact is too far from everything that visitors look for unless you are attending a conference at the convention center. The units are one of the smallest in all Waikiki (most are less than 240 sqf including the bathroom), majority of rooms have hardly enough space for 2 twin beds or one Queen bed. None of the units have any balconies, they have windows but because of liability concerns, they only open a few inches. Most of the units have not seen a renovation for quite some time other than cosmetic such as bed spreads, curtains or carpets, the hotel was closed as such for a few years. It is normally posted fairly inexpensive but for a few dollars more you can get a lot more hotel and in a better location.